A dystopian science fiction novel about a man who sleeps for two hundred, waking up in a completely transformed London. The main character awakes to see his dreams realised, and the future revealed to him in all its horrors and malformities. The story of W. P. Benham is the story of a man who was led into adventure by an idea. It was an idea that took possession of his imagination quite early in life, it grew with him and changed with him, it interwove at last completely with his being. Stella and Gemini come increasingly under the influence of a rather impressive psycho-therapeutist whose groundbreaking theories capture their imaginations. But when tragedy strikes they are soon to learn that intellectualism brings cold comfort. Presented as a miraculous cure-all, Tono-Bungay is in fact nothing other than a pleasant-tasting liquid with no effects. When the young George Ponderevo is employed to market this medicine, he finds his life overwhelmed by its sudden success. This collection of short stories can be a very accessible introduction to the writings of H. G Wells. Themes: biological weapons, carnivorous plants, strange creatures in remote parts of the World, hallucinations and telepathic visions, etc. In his War of the Worlds, H. G. Wells imagined aliens from Mars descending to Earth. In Star Begotten, first published in 1937, the suspicion arises that the Martians may have returned -- this time using cosmic rays to alter human chromosomes. In 1907, a naive Londoner Bert Smallways finds himself an unwitting passenger on a fleet of German airships heading over the Atlantic to attack New York. What unfolds is a clash of early flying machines that unleashes the terrible age of Total War. Science fiction novel featuring a utopian parallel universe. It is about a group of people who are drawn into an alternate dimension, which turns out to be a paradisiacal version of Earth thousands of years in ahead of contemporary society. Young and ambitious science student is locked in a struggle to further himself through academic achievement. But when his former sweetheart re-enters his life, his strictly regimented existence is thrown into chaos by the resurgence of old passion. A provocative novel by H.G. Wells. In the midst of a world war, a comet brushes the atmosphere of earth, causing everyone to lose consciousness for a few hours. When the world awakens, everyone has an expanded understanding of the meaning of things. The Island of Dr. Moreau, originally published in 1896, is a science fiction novel written by H. G. Wells that addresses the ideas of society, community and human nature. Wells also touches on the concepts of eugenics and Darwinism. A collection of short stories by H. G. Wells. His normal mixture of science and speculative fiction includes these stories: The Magic Shop; The Truth About Pyecraft; The Story of the Inexperienced Ghost; The New Accelerator; The Stolen Body; etc. The novel is considered one of the earliest works of science fiction and the progenitor of the 'time travel' subgenre. Wells advanced his social and political ideas in this narrative of a nameless Time Traveller who is hurtled into the year 802,701. An examination of scientific ethics that helped define an important genre in science fiction. Two scientists invent a miraculous substance nicknamed 'The Food of the Gods.' Its consumption causes accelerated uninterrupted growth in all forms of life. An obscure scientist had found a way to turn skin, flesh, blood and bones invisible--and tried the formula on himself. The Invisible Man had only two problems. He couldn't turn visible again. And he had gone quite murderously insane. Wells' novel, first published in 1901, describes a thrilling voyage and a moon of his own splendid imagination. It is a beautiful land, alive with vegetation. There are strange creatures who threaten the explorers and fill their days with adventure. The story of a promising public figure used up by his job and obsessed by a vision of an enchanted garden he had known as a child. It is a tale of the attempt to recover a period when our lives were simpler and complications lay far in the future. 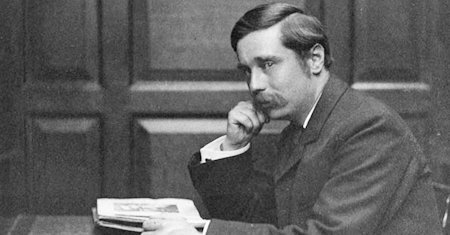 H. G. Wells explores the relationship between the fantastical and everyday. Here horror meets humor: this is a marvelous literary universe showcasing the author's fascination with the wonders and perils of scientific progress.